Welcome to Cornel’s World, where an animated group of reptile aficionados bring Animal Planet’s audiences up close to these animals as they work together with reptile owners to strip away the ordinary walls of their pet’s terrarium and transform them into custom-made masterpieces that cater to their reptile’s unique needs and personality. For this crew of reptile lovers, led by shop owner Greg West and his wife and creative designer, Elaine, it’s not just about the terrarium but showcasing the incredible reptiles that occupy these tailor-made enclosures and enlightening others on how to properly care for these amazing creatures. SCALED premieres Friday, August 24 at 9PM ET/PT. Each week viewers follow the crew of master builders, habitat designers, self-proclaimed reptile nerds and their 3-legged bearded dragon and shop mascot, Kevin, as they dive into the needs and behaviors of reptiles to design one-of-a-kind terrariums that promote their well-being and bring their multifaceted personalities to life through stunning visual and behavioral elements. Through lively ‘meet and geek-out’ consultation sessions with clients, the crew creates the best natural environment to keep the pet happy with special features and appliances, from water misters and drainage tubes to special retile hides and proper vegetation. The season premiere of SCALED kicks off with Greg, Elaine and the team building a Mayan temple themed rainforest for a special beloved community of dart frogs. Together, the crew works tirelessly to bring the natural jungle environment to the frogs by creating a fully functioning bio-active eco-system within the terrarium. Other episodes this season will include extraordinary themed terrariums, featuring everything from mobsters & gangsters to princesses, a one-of-a-kind post-apocalyptic dinosaur wasteland, and even an Avatar inspired enclosure that will take you out of this world! Viewers will also get an in-depth look at an array of unique reptiles featured throughout the season including an Asian vine snake, a basilisk lizard, a monkey tailed skink, as well as ball pythons, albino boas, agamas and more! 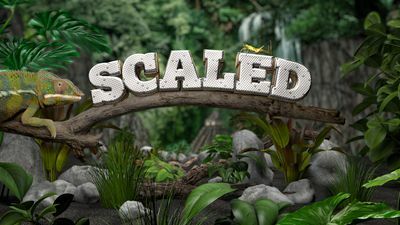 SCALED is produced for Animal Planet by Matador Content where Jay Peterson, Todd Lubin and Jerry Carita serve as executive producers with Pete DeLasho as showrunner. For Animal Planet, Pat Dempsey is producer with Valerie Moss as production coordinator.